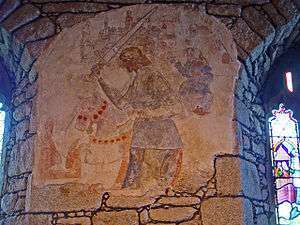 A Fresco-secco wall painting in St Just in Penwith Parish Church, Cornwall, UK. The painting was created in the 15th century and depicts Saint George fighting the dragon. Fresco-secco (or a secco or fresco finto) is a wall painting technique where pigments mixed with an organic binder and/or lime are applied onto a dry plaster. The paints used can e.g. be casein paint, tempera, oil paint, silicate mineral paint. If the pigments are mixed with lime water or lime milk and applied to a dry plaster the technique is called lime secco painting. The secco technique contrasts with the fresco technique, where the painting is executed on a layer of wet plaster. Because the pigments do not become part of the wall, as in buon fresco, fresco-secco paintings are less durable. The colors may flake off the painting as time goes by, but this technique has the advantages of a longer working time and retouchability. In Italy, fresco technique was reintroduced around 1300 and led to an increase in the general quality of mural painting. This technological change coincided with the realistic turn in Western art and the changing liturgical use of murals. The treatise Silparatna by Kumaradeva (8th century) gives an account of the Fresco-secco painting technology in detail. According to this text, a picture should be painted with appropriate colours, along with proper forms and sentiments (rasas), and moods and actions (bhavas). White, yellow, red, black and terre - verte are pointed out in the text as pure colors. Different shades were also prepared from these original colors. Five types of brushes with various shapes and size (flat, long, medium etc.) made of animal hair and grass fibre are also recommended. Specialist painter and decorators still use this technique to great effect in the world of interior design e.g. faux marble. June McEwan, Scottish artist who recreates historic Scottish interiors. Beohar Rammanohar Sinha, artist from India whose frescoes ornamentate the walls and gigantic dome of the Shaheed-Smarak or India's Martyrs' Memorial Auditorium. Episodes, accomplishments and landmark-events in India's struggle for independence are depicted. A fresco-secco by Beohar Rammanohar Sinha on the walls of Shaheed-Smarak in Jabalpur (India). Rudolph F. Zallinger - whose Age of Mammals, a 60 by 5 feet (18.3 by 1.5 m) mural painted from 1961 to 1967 on the south wall of the Yale Peabody Museum of Natural History, is painted in this style. ↑ Secco. In: Weyer, Angela; Roig Picazo, Pilar; Pop, Daniel; Cassar, JoAnn; Özköse, Aysun; Vallet, Jean-Marc; Srša, Ivan, eds. (2015). EwaGlos. European Illustrated Glossary Of Conservation Terms For Wall Paintings And Architectural Surfaces. English Definitions with translations into Bulgarian, Croatian, French, German, Hungarian, Italian, Polish, Romanian, Spanish and Turkish. Petersberg: Michael Imhof. p. 84. doi:10.5165/hawk-hhg/233. ↑ "Recreative & conjectural paintings". The Works. Retrieved 16 June 2013. ↑ "The Age of Mammals mural". Yale Peabody Museum of Natural History.